Special thanks for the night go to the CBSA, who held all merch at the border. Because, you know, touring bands who count on those merch sales need yet another reason not to cross the border into BC. Alas, Totimoshi were up first. It was their first time in our fair city and -if the odor of Otto’s jacket suddenly permeating the Rickshaw two or three songs in was anything to go by- they impressed the hell out of the sold-out Rickshaw crowd with their groove-laden set. Serious riff disciples that they are, a fair bit of Totimoshi’s set was instrumental; on those songs Tony Aguilar did sing (“The Avenger”and “The Line”, for two), his capable vocals almost take a back seat to the workmanlike heavy-blues jams he and bandmates Meg Castellanos and Chris Fugitt were laying down (or maybe it was just the house mix). Nonetheless, Totimoshi were a killer warmup to the Melvins – but, long as they’ve been around, I’d love to see them headline a show here at a smaller venue and play longer. 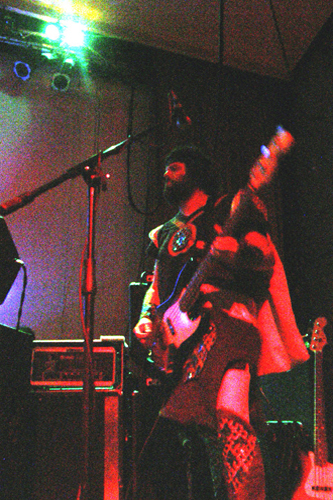 Aguilar and Fugitt were also acting as the Melvins’ roadies and once their own set was complete, remained on stage to make sure things were just-so for the four-pronged Melvins attack. Having seen the Melvins in previous three-piece variants over the years, this was my very-excited first time seeing this four-on-the-floor version that includes the Big Business guys, even though the band’s been touring in this incarnation since 2006. 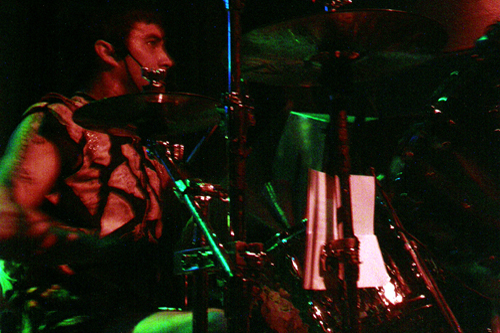 First, the stage set-up is key: Looking like one monstrous kit, the twin drumsets are dead center of the stage mirroring each other as centerpiece of the show. Yes, everybody is situated right up front and gets to act as frontman-in-his-own-right in Melvins Mark, what is it, now, Eight? Soon enough, the PA raised up with “Duelling Banjos” and out they stepped in various costumes (L-R): Buzzo in some sort of animal-patterned, turtle-necked black-druid muumuu; Coady and Dale as fur-shouldered, Flintstones-esque barbarians; Jared as a McEnroe-whafro-banded gladiator. A sudden glare of feedback and the band lurched into a throbbing version of Flipper’s “Sacrifice”, immediately followed up with the gargantuan “Civilized Worm”; it was about then that the phrase ‘superdrum juggernaut’ got stuck in my brain. 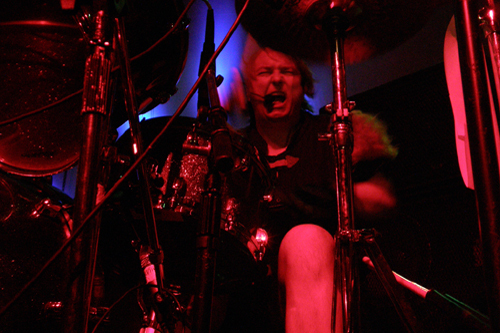 Long a drum god in his own right, Dale Crover has met his match in Coady Willis, and in tandem, they are thunder anthropomorphized. I mean, all due respect, but the whole set is basically an excuse for a (rightfully) unapologetic drum solo, and the two drummers are mesmerizing to watch. The band proceeded to stomp all over “Black Stooges”, “Pig House”, “Electric Flower”, and even dug way back into the grunge history books for “Anaconda”, “Hung Bunny”, and “Roman Bird Dog” (for those of us who remember when it was just Buzz, Dale, and whoever that year’s bass player was). Buzzo and Jared, complementary afros a-bob, hold their own onstage against the percussive fray, equally compelling as the band’s main lead vocalists (though, at some point in the set, each Melvin gets a turn at the lead vocal) – and Buzzo will always be a monster guitar player. Good god man, the guy’s riffs defined and mapped a certain era in sludge-rock history! After the tribal thump of “Billy Fish”, the band decamped backstage for ten minutes or so, only to reemerge and rip into the over-top hoo-AH! drill of “The Water Glass”, which for me, was the highlight of the set(s). The four of them ooga-chucka-chanting the cadence as the drums rumbled ‘neath it all was the show-stopper (although it was closely equaled by the hammering drum-off at the end of “Lovely Butterfly”). 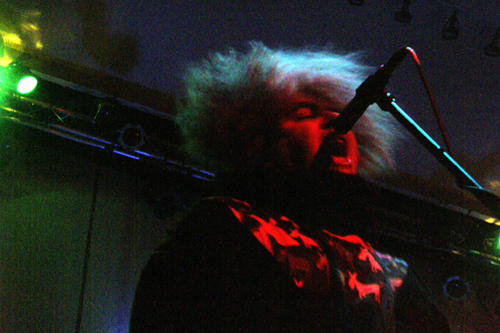 All in all, with a massive set concentrating mainly on the last three records, Melvins remain a force to be reckoned with, and consistently relevant, challenging, and heavy in a way so many of their peers weren’t able to. I will always look forward to seeing them. One of the roles of music is to transport the listener to another place. 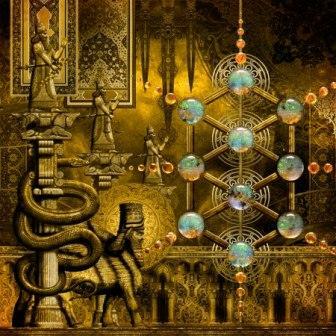 On Epigenesis you could literally pick any track, close your eyes and be transported to the Mediterranean/Middle East just by subtle musical nuance.